More than 50,000 Lithuanian-Americans fought for the United States in World War I. This remarkable number was later leveraged to lobby U.S. President Woodrow Wilson to recognize the newly independent Lithuanian state that emerged from the War’s aftermath. Ironically, the vast majority of the young Lithuanian men who served America in World War I were fighting for a country they barely knew. Most were very recent, impoverished immigrants—not yet citizens–who barely spoke or read English and who, even more ironically, had fled Lithuania to escape 25-year conscription by the Russian Czar. When we think of Jonas (John) Kedis, Joseph Kowlowski, Walter Rauktis, and Stephen Shvagzdis, four young immigrants to Central Illinois who died in the War to End All Wars, we must face the fact that they died violently, far too young, and so very far from family and home. This is the tragic reality of war even for non-immigrants. But the fact that these young Lithuanian-born men were shipped back across the Atlantic to die violently so soon after they had crossed the Atlantic with so much courage and hope strikes me with a special poignancy. 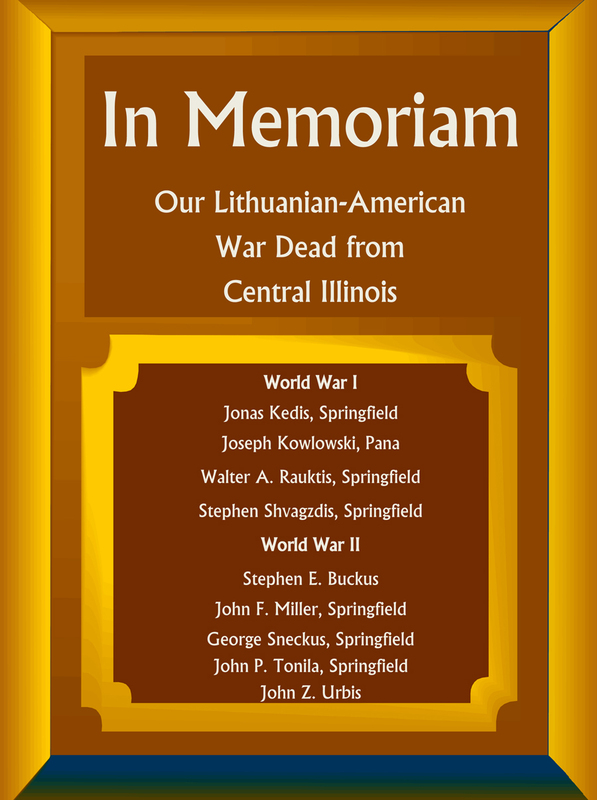 Thanks to exhaustive research of U.S. Census, draft and service record databases by our Lithuanian-American friend Tim Race of Elmhurst, Ill., we have the partial stories of Jonas, Joseph, Stephen, and Walter, whom we now honor in memory. Jonas (John) Kedis, born about 1890 in Kaltinenai, Lithuania, arrived in the U.S. in April 1910 from the Dutch port of Rotterdam on the ship Rijndam. Although he lived in the 700 block of E. Washington St. in Springfield in 1916, Jonas was living and working in Chicago as an iceman for Commonwealth Ice Co. by the time he registered for the draft on June 5, 1917. About 27 years old of medium build with light brown hair and blue eyes, Jonas was an “alien” who had sworn an oath of loyalty to the U.S., and declared no dependents on his papers. He was killed on Oct. 9, 1918 while serving as a private with the U.S. Army’s 1st Engineer Regiment, 1st Infantry Division, and is buried in the Meuse-Argonne American Cemetery in Romagne-sous-Montfaucon, Lorraine, France. Ironically, if Jonas had survived another five weeks, he would have made it to armistice. According to the New York Times, 26,277 Americans died during the 47 days of the Meuse-Argonne Offensive as they threw themselves against the most dense, sophisticated and deadly fortifications in history, turning the tide of the Great War. “It remains, to this day, the deadliest battle in American history.” The reason? “The Germans had had four years to set up their defenses in the area, and they didn’t waste a single day of it: Everywhere you go in the Argonne, you’ll find (evidence of) German trenchworks, pillboxes, blockhouses, artillery pits,” once complete with officers’ villas, rest camps, waterworks, and electrification. The Times also notes that the American Cemetery at Romagne-sous-Montfaucon, Lorraine, France, where Pvt. Kedis is buried, is the largest American cemetery in Europe from either World War I or II, holding 14,246 dead. To read more about how dug-in the Germans were, and how Americans turned the tide at Meuse-Argonne, see http://www.nytimes.com/2014/12/28/travel/in-france-vestiges-of-the-great-wars-bloody-end.html?action=click&contentCollection=Opinion&module=MostEmailed&version=Full&region=Marginalia&src=me&pgtype=article Walter A. Rauktis, born in Veikanus? (possibly Viekšniai), Lithuania in 1891, was mining for the Jones & Adams Coal Co. on RR #8 and living at 2518 Peoria Road in Springfield when he registered for the draft on June 6, 1917. He described himself as single, but with a mother and father who depended on him for support. 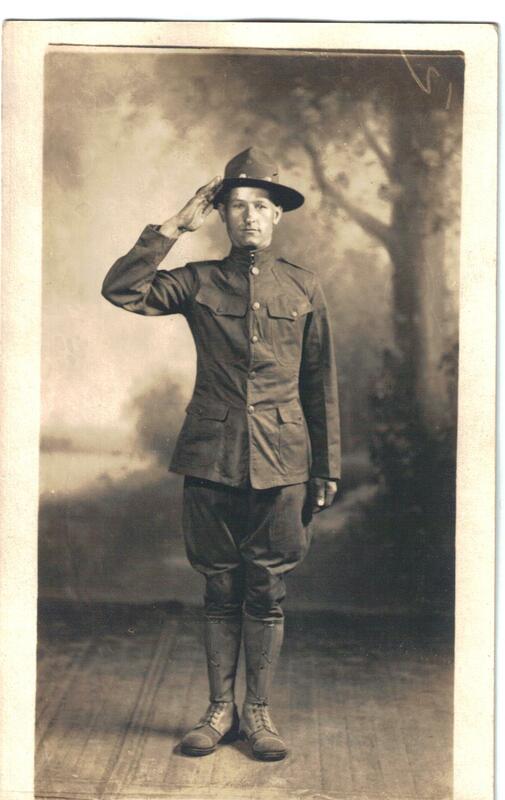 Walter had blue eyes and light brown hair, and was not yet a citizen, either, when he was killed in service to our country as a private with the U.S. Army 47th Infantry Regiment, 4th Infantry Division on July 29, 1918. Walter is buried in the Oise-Aisne American Cemetery in Fere-en-Tardenois, France. Pvt. Rauktis is in the back row, right edge, in this photo from the Illinois State Journal-Register. Young coal miner Joseph Kowlowski, born in Marijampole, Lithuania in 1893, migrated from the Pennsylvania coal fields to Pana, Ill. sometime after 1910. He would have been in Christian County for 7 years or less when he was drafted in 1917. (We hope to get a few more details about Joseph’s life, death and burial place soon.) Stephen Shvagzdis was born in 1890, the son of Mrs. and Mrs. Michael Shvagzdis. He was living at 1413 E. Adams in Springfield when he entered the service in April 1918. He trained at Fort Dix, NJ, was shipped overseas in June 1918, and served as a private with Company K of the 148th Division of the U.S. Army in the famous Meuse-Argonne Offensive. 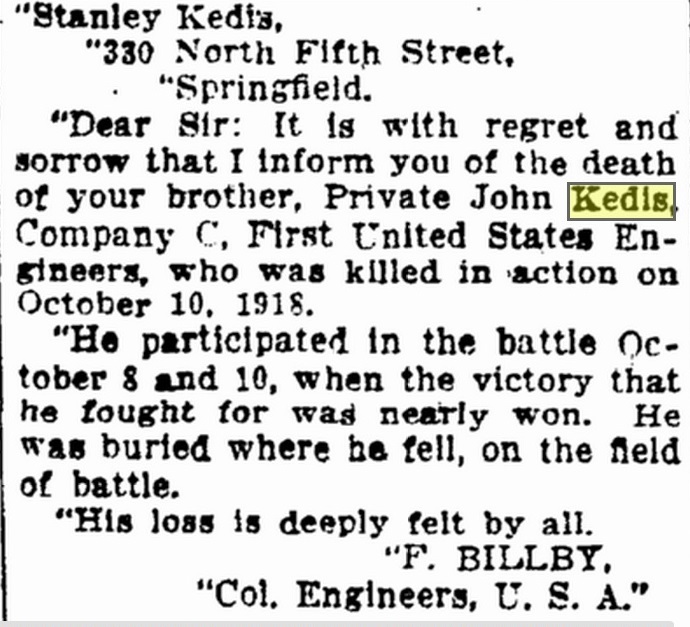 He was killed in action Nov. 11, 1918, Armistice day of the War to End All Wars. He could have missed only by hours or minutes being honored as the very last soldier in the entire War to be killed: American Pvt. Henry Nicholas Gunther of Baltimore, 23, shot through the head at 10:59 a.m. on Nov. 11, 1918. A small monument still stands on the spot where Pvt. Gunther was killed, probably not far from where Pvt. Shvagzdis fell, near the tiny village of Chaumont-devant-Damvillers. The following World War I veterans entries from the Springfield City Directory were located by genealogy company, Genealogics. Below is a larger list of Lithuanians from Central Illinois who registered for the draft and possibly served our country in World War I. Their names and counties are from a database developed by Genealogics in much-appreciated voluntary assistance to this project. Each is from Springfield unless otherwise noted. 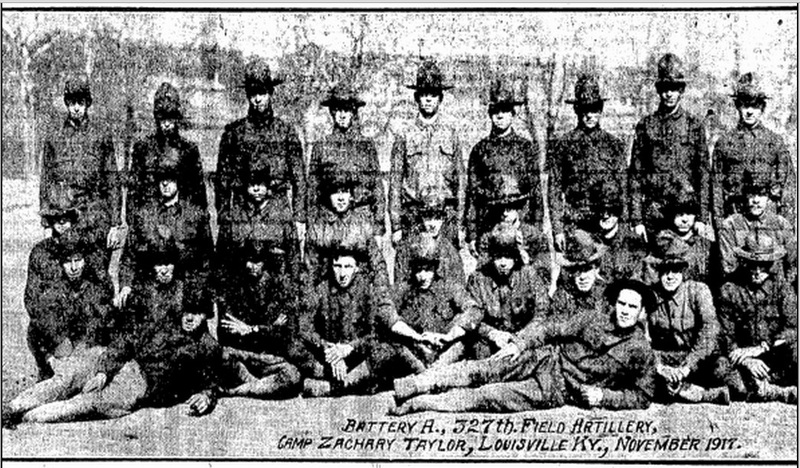 Many other Lithuanian-Americans from our area were drafted or enlisted and served in World War I, but their service could not be verified because they listed their country of origin as Russia. (Lithuania was part of the Russian Empire until after World War I). Names in italics definitely served and were submitted by their descendants or research sources. Two survived the War only to die in our local coal mines. William Blaskie, Joseph Damkus (came to Springfield in 1898, worked as a policeman after 1906 and lived with his wife Isabel Adomaitis at 1809 N. 10th St.), Mike Bubnis, Frank Embrolitus (Macoupin, killed in coal mining rock fall, Gillespie, 1941), Andrew Fraier, Joseph Gedman, Anthony Glemza, Charles J. Grigas, John F. Gurgens (Army, Camp Wadsworth, limited duty), John Kalvatis (Montgomery County), Mike Kavaloski (Macoupin County), Franciscus J. Krasauskis, Charles Kristute (Pawnee), John Kukowich, John Kunski (Montgomery County), Jurgis Lanauskas, Stanley Norbut, Stanley Patrilla (Auburn—also lived on Jefferson St. in Springfield with the Papir family), Charles Paulanski (Logan County), Joseph Paulauskas (moved to Detroit after the war), John Petkus, William Petraits (Christian County), Joseph Petrushunas, Stanley Petrokas, Anton J. Petrouch (Divernon), Frank Petrowich (Auburn), Joseph Plaskas, Joseph J. Poder, Alex Potsus, Charles Raczaitis (Divernon–gassed in action), George Ragoznice, Charles Rumsas (Sangamon County), Sylvester Senkus, John Joseph Straukas (lived in Riverton as a nephew of the Grigiski family), George Stravinski, Frank Tonelis, John Treinis, Mike Trumbit (Macoupin County), Frank B. Vinson (Christian County), Ignatz Wecksnis, Paul Widowski (killed in a Madison Coal Co. mine explosion, Divernon, 1923), John Joseph Yacubasky (Yates), Stanley (Junkeris) Yunker (went on to become the long-time pastor of St. Vincent de Paul Lithuanian Catholic Church), Andrew Zelowski (Christian County), Joseph Zvingilas. Wonderful tribute to these veterans. God Bless them. And, God bless you Sandy, for your research and writings. A very timely article. It is sad to think of these young men losing their lives in war. I am glad that we can remember them today.